Apple announced Raw Compatibility Update 4.04, which adds Pentax Q support to Mac OS-X (and by implication, to iPhoto, Aperture, and a number of other products). Perform a system Software Update (or use the App Store update if you're on Mountain Lion) to get the update. 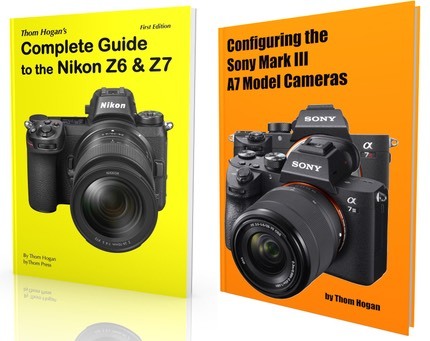 Sony announced firmware updates for the NEX-5N, NEX-5R, NEX-6, and NEX-7 cameras, plus updates for the 30mm f/3.5 macro and 50mm f/1.8 lenses. The 5N and 7 version 1.02 updates add automatic lens correction for the 16-50mm lens, plus addition improvements and fixes. The 5R and 6 version 1.01 update provides faster hybrid autofocus (but you may need to update your lenses, too). Sony's update page is here. Nikon posted firmware version 1.21 for the V1 camera, which fixes a problem with live view performance when you change lenses. Nikon's update is here.